Discussing the roles played by women in freedom struggle through the lens of Gandhi is a difficult task as it employs both- their enhancement in one way and limiting them in another way. Everyone knows that Gandhi, Nehru and Patel were the major advocates of the nationalist movements of satyagraha and non-violence but only a few agree that their advocacy shaped the movement into monochromatic and patriarchal in nature. There were not only male leaders in the history who resisted against the British rule. Rani of Jhansi, Begum Hazrat Mahal and Rani of Ramgarh are few names who resisted the British rule in a way that Gandhi did not agree upon. Gandhian theory on women in freedom struggles was totally different from the role played by Rani Laxmi Bai. Laxmi Bai symbolizes the feminine strength that is usually associated with masculine bravery. Her style of fighting, strategies and ruling a kingdom were all associated with masculinity. She had set an example, which showed a whole different face to the traditional definition of female heroism. However, she became the epitome of strength and bravery but not all leaders saw her the same. Gandhi was one such leader who rejected her style and moreover, advocated for an alternative non-violent representation. Gandhi advocated the role of women by religious and traditional symbols of Indian womanhood. He compared British rule as Ravanraj and focused on women to protect their land in the same way as Sita fought to preserve her chastity. He used these as tools to manipulate the system and get a hold to the entry of women in the political sphere. In addition, he limits their strength to the realm of “moral and spiritual courage”. Aggressiveness and violence were not seen as a viable tool for attaining swaraj. Women were insisted to use their “superior” qualities of passivity, patience and self-sacrifice to attain their goals. Further, Gandhi defined their role in the movement by tagging them with “non-violent” and “domestic” in nature. Although he campaigned for the emancipation of women, he kept their contributions separate. 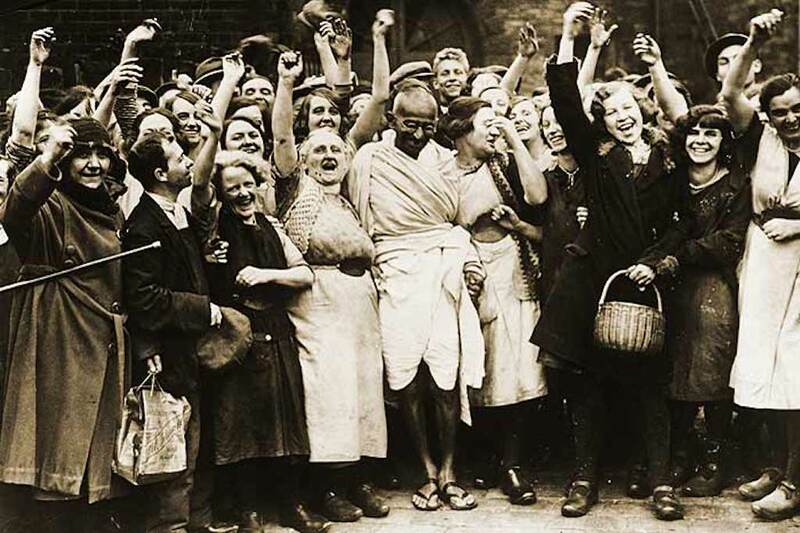 According to Gandhi women are the epitome of non-violence and it is their innate nature to be passive. She has been assigned with the primary role to instil the feeling of Indian nationalism in a child. Swaraj also meant the reconstruction of the society and women were assigned the domestic sphere to rehabilitate it. In non-cooperation movement (1921), Gandhi formed a program of spinning khadi for women whereby they can contribute from their homes. He further stated that spinning khadi is such a laborious work and because of the inert patience women were given this task. However, on the other hand, what complicates Gandhi’s view is that he was not totally against female leadership in politics. He patronized entry of a handful of women into the leadership positions. Analyzing further the women who broke the glass of political sphere belonged primarily to the upper middle class. These women were considered as the models for others to an extent that whatever they said or asked for was considered as the final call for the lower-class women. These handful educated elites represented the ‘women’. तो क्या 125 साल पहले गांधी की ‘कंजूसी’ की वजह से उन्हें ट्रेन से उतार दिया गया था?